Base Camp Greenland – The Great Canadian Travel Co.
A deluxe expedition camp for those looking to explore East Greenland in depth in a unique way. There are local guides on hand to provide in-depth information and guidance but leaving you lots of time to do your own thing! Prices are quoted in US$, per person based on two people sharing a twin room or one person in a single room. Single travellers willing to share accommodation with another traveller of the same gender will be charged the per person twin price. Even if a roommate isn’t found you won’t pay for a single room. You are met on arrival at Keflavik International Airport and transferred to our hotel in Iceland’s capital of Reykjavik, about a 45-minute drive. If you arrive very early, you may store your bags at the hotel while you enjoy exploring the compact city. This evening, learn about all that lies ahead in Greenland during a welcome presentation and dinner with our Expedition Leader. For adventure travellers looking for the ultimate Arctic experience, this is it. You can now experience the staggering natural wonders of Greenland in complete comfort, without giving up an immersion in some of the most remote wilderness on Earth. Previously this region was accessible only via hiking while camping in tents, or on a very limited basis by ship via short day excursions. 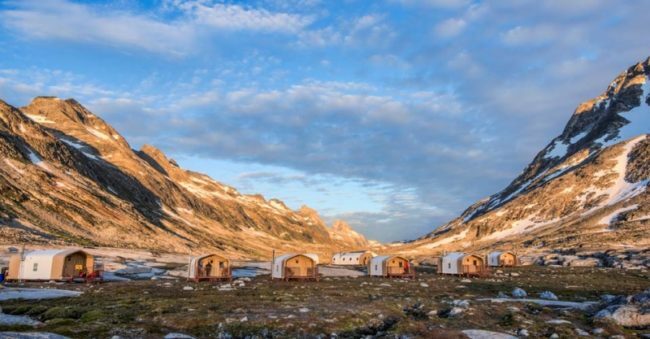 Now, with the debut of Base Camp Greenland, our clients have a whole new (and better!) option. 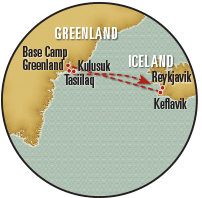 The group will transfer from the Reykjavik hotel to the nearby airport to board the flight to Kulusuk, Greenland, two hours away by air. From Kulusuk, we make a short, scenic transfer by helicopter to Ammassalik Island, landing in Tasiilaq, the small administrative center of East Greenland. Though it’s just a 10-minute flight, it offers a preview of the magnificent scenery to come, with icebergs drifting below and the chance to spot a whale from the air. Tasilaq’s charming collection of brightly painted, wooden houses hugs King Oscar’s Bay, surrounded by pointed peaks iced with glaciers. The town of 2,000 is a hub for outdoor adventure, from hiking and kayaking in summer to dog sledding and glacier skiing in winter. Virtually uninhabited except for a handful of small subsistence-hunting communities, Greenland’s east coast is often called “the back side” by those on the west, where most of Greenland’s population lives and where its capital and main institutions are located. East Greenland’s people had no contact with the outside world until the turn of the 20th century, and that isolation has fostered a distinct and resilient culture. Our introduction to Greenland begins here where Arctic wilderness and traditional lifestyles meet. On arrival we convene at our hotel for a briefing before exploring the area around Tasilaq on foot, hiking into the Valley of Flowers above the scenic bay that fronts the town. Bring your camera! The ice-clad gneiss and granite peeks provide a backdrop for waterfalls and small lakes fringed by arctic wildflowers in season. Though the interior of Greenland is covered by a massive ice cap, a few habitable areas exist around the bays and coastal islands. The region we visit enjoys a surprisingly mild and dry summer climate, earning it the nickname “Arctic Riviera.” Our exploration starts with a half-day excursion by enclosed private motorboat in the open waters of the Greenland Sea, for our first close-up views of icebergs. In addition to large chunks of ice calved from glaciers that feed the fjords in this region, we’ll also see tabular icebergs—these are ocean-going slabs of ice, some of which have been drifting for months or even years, driven down the coast by the strong East Greenland Current. Glaciologists believe that some have even come from northern Canada, hundreds of miles away. Once they reach the outer edge of Greenland’s fjords, they collide with ice that has broken off the Greenland ice sheet to form gigantic composites, sometimes mingling with brash ice to create frozen mosaics. Whales are also found seasonally in these waters, when ice conditions permit, and we’ll look for fin, minke and humpback whales, as well as seals. Back on shore, we explore the coastline on a scenic walk and visit Tasiilaq’s small history museum to learn about the culture and traditions of the Inuit, at home in this region for centuries. 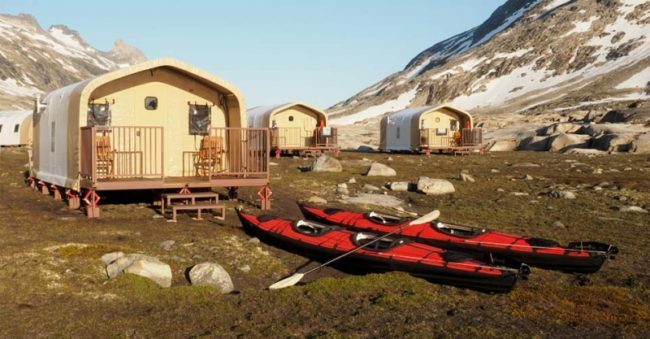 Depart via boat or helicopter for our exclusive wilderness Base Camp, located on the east side of Sermilik Fjord. Our destination is near the tiny hamlet of Tinit, which we’ll visit at some point during our stay. 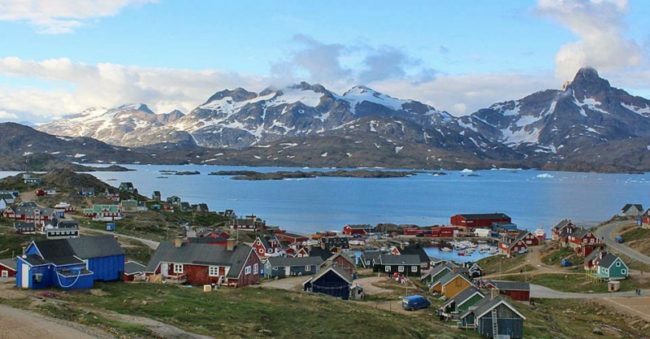 The village is one of the most picturesque outposts in East Greenland, surveying a panorama of Sermilik Fjord, littered with huge icebergs, and the ice sheet beyond. Behind the town, glaciated peaks rise over a mile high, jutting up like sharp black teeth through the ice. Tinit is home to fewer than a hundred hardy people who craft a subsistence fishing and hunting existence around challenging weather and constantly shifting ice conditions. Keep an eye out for whales as we travel, as they are frequently seen in these waters when ice conditions permit. The area is filled with evidence of ancient habitation, including graves and ruins of old Inuit sod house foundations, and it is an evocative place to learn more about Inuit history and lore. Reaching Base Camp Greenland, we find ourselves in one the most remote places on Earth. After settling in to our deluxe private cabins, sit down for coffee, tea and lunch. Later we’ll convene for an orientation to our environs, followed by dinner and a lecture to acquaint us with the remarkable natural history of the region. Through presentations and cultural visits during our stay, we also learn about Greenland’s cultural heritage and aspects of modern life. Traditional Inuit identity remains at the forefront in East Greenland, and during our time out at camp, we have an authentic encounter with this enduring culture that remains largely in harmony with nature. The landscape along Greenland’s isolated and rarely visited east coast is dramatic. Great fjords indent the coastline, penetrating far into sheer-sided mountains capped by the world’s second-largest ice sheet—and Sermilik Fjord is the mightiest of them all. Our base camp provides a safe and comfortable outpost from which to explore this vast expanse of wild terrain just below the Arctic Circle. Though we are profoundly secluded, the wider region is dotted with a few isolated villages where Greenlandic Inuit people practice subsistence lifestyles in this uncompromising Arctic environment. In varied encounters, we learn about their culture and how they are retaining their traditions while adapting to contemporary life in the 21st century. 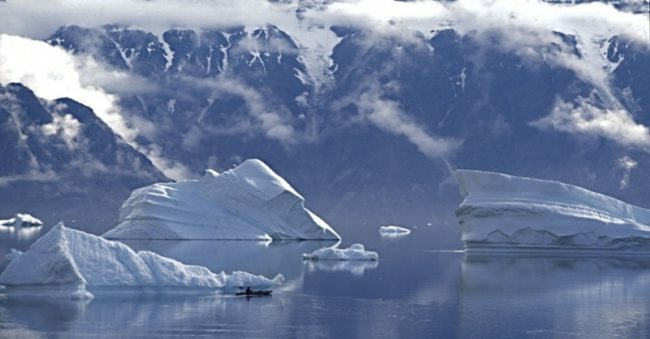 On Zodiac excursions, we navigate among a flotilla of icebergs in an array of wild shapes, some as big as buildings. Look for whales and seals, both of which are present depending on the ice. 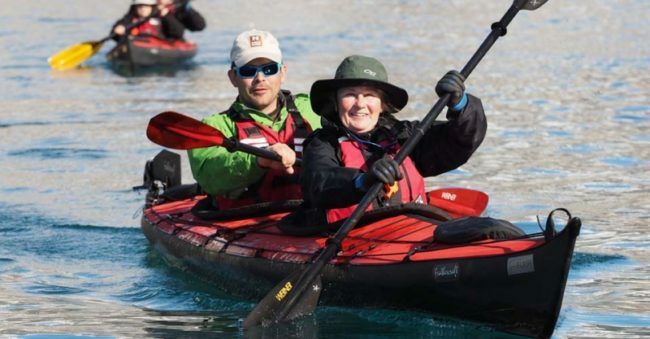 Guided sea kayaking is also an option for an eye-level view on the frigid waters around us. We spend plenty of time ashore, too, with hikes for varying ability levels. Traverse the mountainsides and wander near glaciers that wind down from the Greenland ice sheet. This huge ice mass—second in size only to Antarctica—stretches more than 1,500 miles from north to south, is nearly 2 miles deep at its thickest point and covers 80 percent of the island. We learn about the crucial role it plays in regulating Earth’s climate and see with our own eyes how rapidly it is being affected by climate change. Amid fields of Arctic cotton grass, look for Arctic fox and birdlife, including eiders, loons and possibly peregrine falcons. The long hours of summer daylight allow for extensive exploration. Each evening, we retreat to our base camp for creative meals prepared by our accomplished chef. After dinner, gather for interpretive presentations by our naturalist Expedition Leaders, who share their extensive knowledge of Greenland’s geology, glaciology and human history. And, though the sun gleams in the sky much of the night here near the Arctic Circle, a good night’s sleep is in order to refuel for the next day’s adventures. Given that our wilderness cabins have real beds with full bedding, you’re sure to get it, wrapped in the profound silence of our surroundings. Guests on later-season departures may even have a chance to glimpse the northern lights, if the aurora is active in the darkening night sky. This morning we bid farewell to Base Camp Greenland and make our way back to Tasiilaq, keeping an eye out for whales and seals and marvelling at the ever-shifting tableau of drifting icebergs. Once back in town, we check in to our hotel and enjoy a last chance to soak up the beauty of this stunning region. Celebrating an extraordinary adventure of discovery, wild beauty and camaraderie, we enjoy a farewell dinner on our last night together in Greenland. Though today is devoted to journeying back to the urban world, it is filled with magnificent Arctic scenery on view from the air. We meet our plane in Kulusuk for the return flight to Reykjavik’s domestic airport where our adventure together ends. A transfer is included to Keflavik Airport for those departing Iceland today or to the group hotels in the city centre. You may choose to extend your stay in Iceland and spend a few days exploring the colourful, capital city Reykjavik or get out into the countryside to see massive waterfalls, geysirs, glaciers and volcanoes. Please Note: This itinerary is meant as a guideline and is subject to change without notice due to weather and ice conditions. On some occasions, it may be necessary to deviate from the intended itinerary for reasons beyond our control. In such instances, we will provide the best available alternative. Moderate Fitness Level Required: All guests must be prepared for typical activities that take place in such a setting, in unpredictable weather and temperatures. Guests must be in good health and have adequate fitness, stability and mobility to participate in this adventure. At minimum, all guests must be able to walk unassisted at least two miles over an uneven, rocky, trailless landscape that may be steep in places. All guests must also be able to get into and out of Zodiacs (rigid rubber boats). When we explore ashore, Zodiac landings can be unstable and either wet (requiring you to walk a short distance in shallow water) or dry (disembarking directly onto land) and can include walking over rocks or large boulder that can be very uneven, slippery and covered in seaweed. While at Base Camp, daily activities include hiking, kayaking and Zodiac excursions of varying durations. Zodiac excursions in the nearby fjords can last up to 8 or 9 hours in total (including stops), with opportunities for hikes ashore to explore geological and historic sights. We expect to operate in generally calm seas, but conditions can change quickly, and we may be exposed in the open boats to cold, rainy or windy weather, with rough seas. Travelers who are susceptible to motion sickness or who have back problems or other health issues that could be exacerbated by such conditions should take this into consideration. Guests who desire a higher level of activity may participate in longer hikes and sea kayaking excursions (weather, ice and local conditions permitting). Hikes take place near sea level with some elevation gain, walking cross-country over rough, uneven, trailless terrain that can include traversing unstable tussocks, loose rock on steep slopes, and small streams. Optional sea kayaking excursions are also offered, with varied itineraries for individual desires and capacities. Our intent is to paddle in largely calm seas, though again, the weather can change with little notice, and excursions can occur in windy or rainy conditions. Shifting ice may also force us to alter our kayaking itinerary. All kayaking activities are accompanied by a guide and safety boat. In Tasiilaq, our hotel is located up a very steep hill above town. While transportation is provided to and from our group activities, should you wish to explore town on your own, you must be able to manage the uphill climb, or plan to take a taxi. Also note that the hotel does not have an elevator, and many of our guest rooms are located on the second floor up a steep set of more than 40 stairs. General information: Please note also that mosquitoes and tiny black flies can be quite prevalent and a real nuisance at camp and during outings on shore, particularly at the height of the summer season. For your convenience, we provide all guests with head nets, but if you have allergies or are particularly sensitive to mosquito bites, please come prepared with proper clothing, adequate skin protection and anti-itch cream for bites, if necessary. 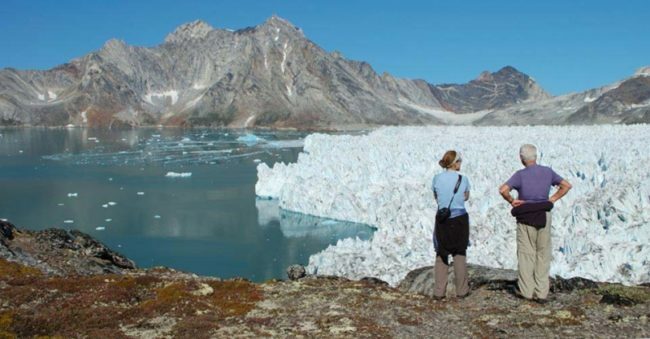 There are important factors to consider when traveling to Base Camp Greenland. The camp is located in a truly wild setting (that’s why we go there! ), meaning that guests must be prepared for all the vagaries that come with travel to such an isolated destination. This is especially so in our northern location near the Arctic Circle, where inclement weather and varying ice conditions can dictate our operations. Add to that the scarcity of operational materials (we’re running a “hotel” in a place where hotel supplies are simply not always available), and a journey to Base Camp Greenland embodies “adventure” in the truest sense. Guests must be prepared for this type of travel, knowing that at times flights may be canceled due to poor weather, routes will be closed due to changing ice conditions, and amenities may become unavailable until a new shipment arrives. There are times where our itineraries will change, perhaps substantially, even to the point where we may be forced to reside in villages and lodges others than those scheduled. We build our itineraries with what we consider reasonable buffers, based on the historic knowledge we have of typical conditions in the region, which is substantial, as Base Camp Greenland’s founder, Olaf Malver, is one of East Greenland’s most experienced explorers. In short, be prepared for anything, but know you’re in expert hands! Mandatory Insurance: Since the areas visited on this trip are remote and wild (that’s why we go there! ), we require medical evacuation insurance for our clients’ safety. If you decline to purchase our medical evacuation insurance coverage you are required to send us documentation of the independent coverage you have in place. The tour operator will add the cost of a medical evacuation policy to your tour invoice until you purchase our insurance or provide our office with proof of coverage including your insurance company’s name, contact number and your individual policy number. Thank you for understanding that our policy exists exclusively in the interest of our clients’ safety.